Verizon Wireless claims to have 5 times the 3G coverage as AT&T. Does Verizon Wireless have more 3G Coverage than AT&T? Checking AT&T 3G coverage map on att.com, there is actually no map for that. You can see AT&T National GSM Coverage is very close to Verizon’s 3G coverage. Keep in mind that GSM doesn’t necessarily mean its 3G. In fact, you have to select cities supporting AT&T 3G/Mobile Broadband from a popup window. Looks like AT&T has 3G coverage in all metro areas. Verizon Wireless voice and broadband (3G) almost overlap each other. Verizon 3G pretty much covers 85% of United States while its voice and messaging reach close to 95%. 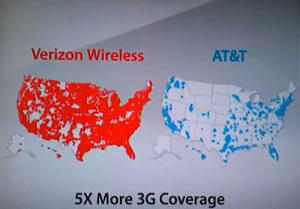 Needless to say, Verizon has more 3G coverage than AT&T and the 5 times bigger claim is very true. So, what does that mean to consumers? For those who don’t use data like checking emails and browsing the web on smartphone, there is no need to worry. You will get the same quality of voice calls whether you are in 3G area or not. But for those who need to be connected with emails and web all the time, it’s best to check whether there is 3G coverage in your area for the carrier of your choice. If you often travel to various locations make sure they have the coverage you need. Both AT&T and Verizon Wireless are great companies and they offer many phones with unique features. Pick the phone you like and we are always here to help you get the lowest prices possible.